Alongside breastfeeding, I think the most significant choice I’ve made as a mother is to wear my baby. A lot. 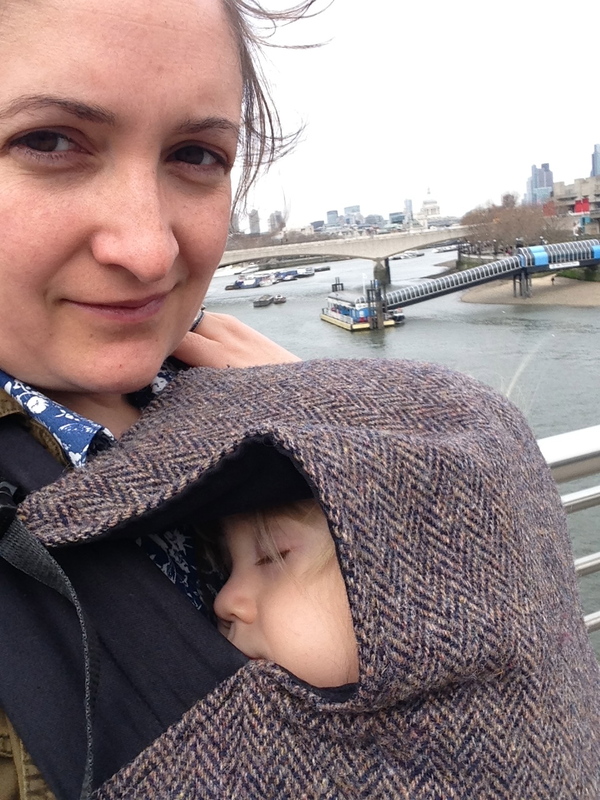 Getting to grips with babywearing transformed my experience of motherhood, and it continues to give us a special combination of closeness and freedom that I’m not sure how I would have otherwise achieved. One of the first books I read as a new mother, once I’d decided that actually some informed advice would be useful before I scared myself silly on internet forums, was ‘The Baby Book’ by William and Martha Sears. I had a hunch that I might be leaning towards an attachment parenting approach – not something I’d really considered before Arthur was born – and reading this book seemed to help everything fall into place. Of course in the early days I didn’t have much choice but to be attached to my baby. Our struggles to get breastfeeding established meant spending an awful lot of time snuggled up in bed, and even when Arthur wasn’t feeding I found I rarely wanted to put him down. We’d bought a Babasling before he was born having been recommended one by some friends, but though I used it for our first family stroll when Arthur was only a few days old neither of us really got comfortable with it. I figured I’d maybe try again when he was a bit bigger, and consigned myself to spending my days stuck on the sofa. The turning point came when I had a visit from a neighbour. She’d just come across to check up on me really – make sure I wasn’t struggling on my own. I remember saying that I was fine, that I was loving being a mum, but just couldn’t imagine how I’d ever get anything done when I was permanently attached to Arthur on the sofa. And she asked whether I’d tried wearing him. 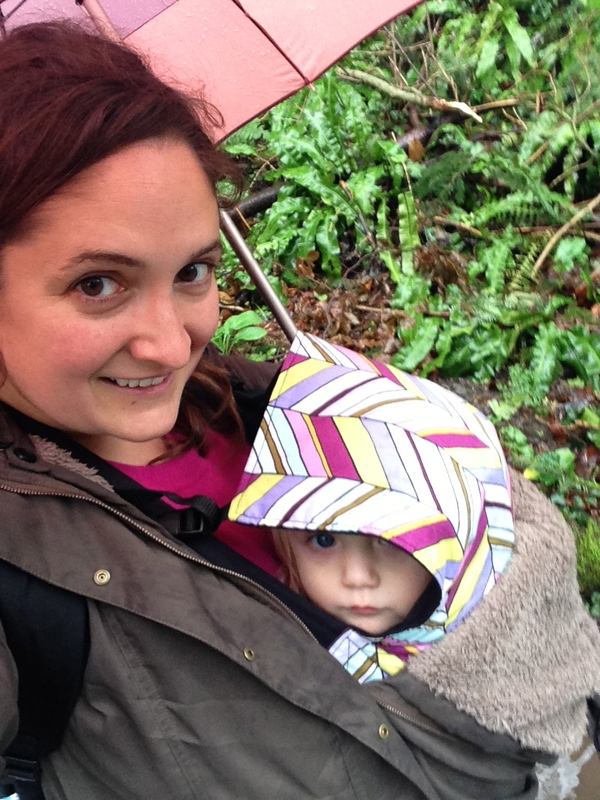 I felt a bit silly when she’d gone – of course that was the solution, everything I’d read about attachment parenting indicated that babywearing was the answer. But after those tricky first experiences I’d just put the whole thing out of my mind. I certainly wasn’t ready to give the Babasling another go, but then I remembered the Moby Wrap. I’d ordered it, taken one look at the intimidating length of material, and put it back in its bag. Maybe now was the time to put my nerves to one side, read the instructions, and see what all the fuss was about. By the time Leigh got home that evening I’d already been wearing Arthur for a few hours and was loving my new found freedom! It’s safe to say we never looked back. At home, I wore Arthur to settle him and to reduce the wind he suffered after feeds. It soon became apparent that it was the best place for him to nap, too, leaving me free to get on with things round the house. 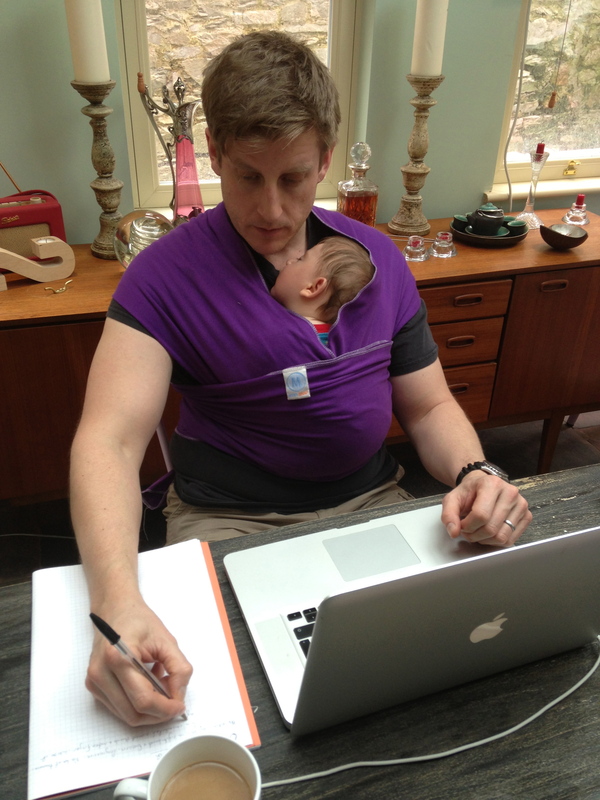 It was soon after my babywearing revelation that I got started on my first novel. With Arthur safely strapped to me I didn’t need to worry about him – we were physically attached, so for a little while at least I could allow my mind to wander elsewhere. Leigh got in on the game too: it was a lovely way for them to develop their bond, even when he had work to do. It also gave us the freedom to get out and about. 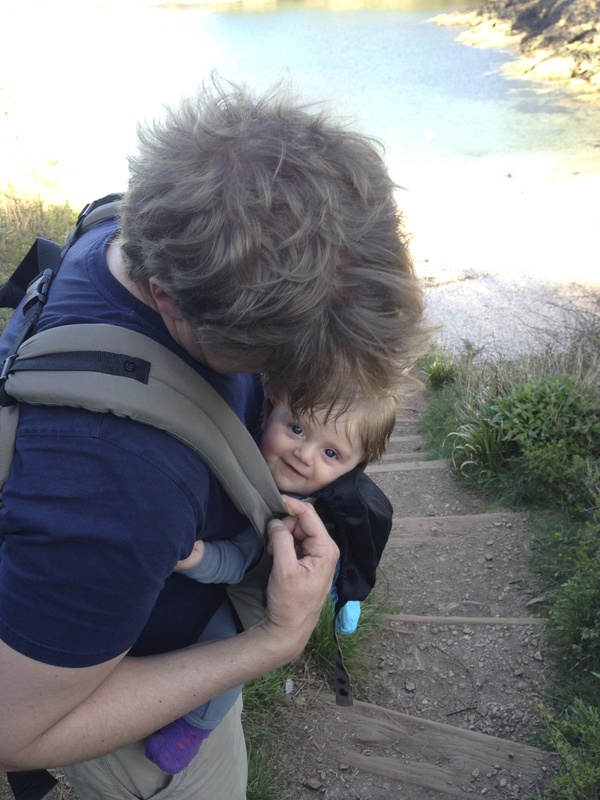 Our local terrain is not best suited to prams, but wearing Arthur meant we could go for walks on the beaches and up to Berry Head – even just going into town was easier without needing to negotiate a pram up steps and round cafes. 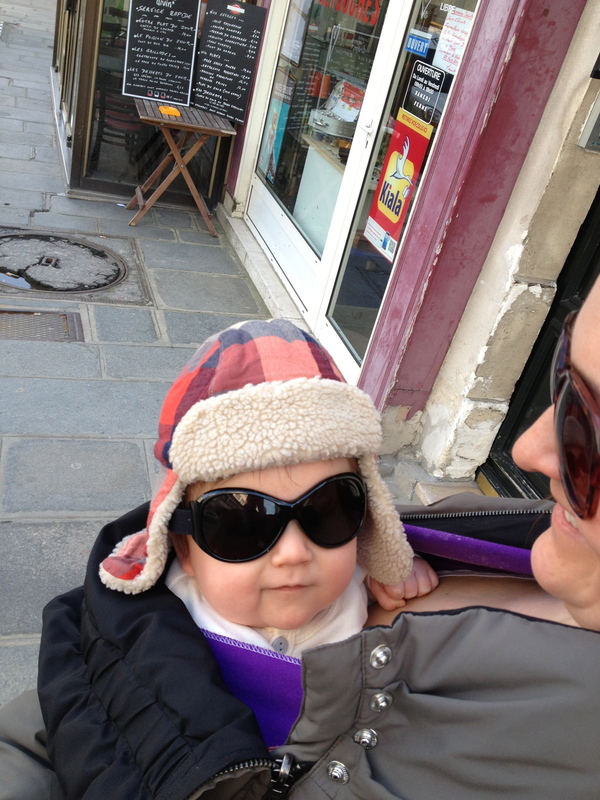 The first big test though came when we took a trip to see my brother in Paris when Arthur was three months old. 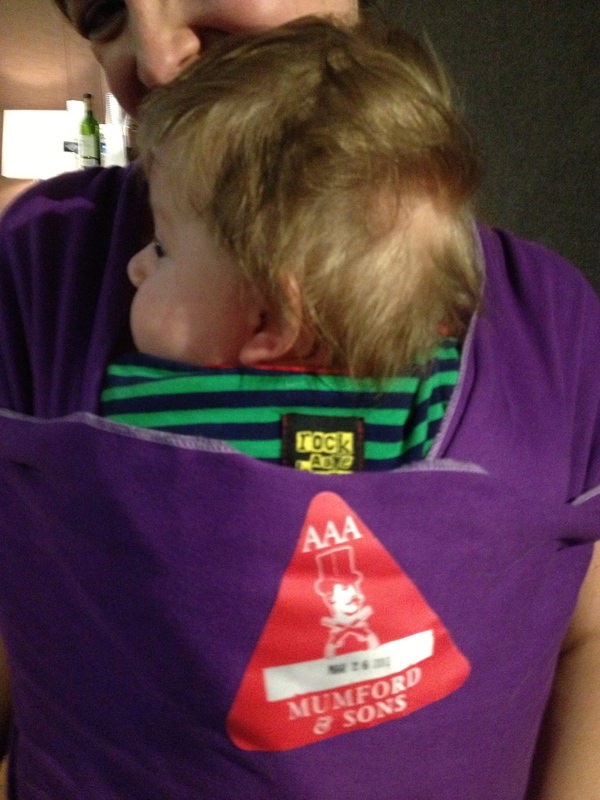 We were travelling by Eurostar, and as well as the usual sightseeing we would be taking Arthur to his first gig. We decided that babywearing was the way to go, and it made everything so easy. As summer approached we were looking forward to lots more adventures, but it became clear that the Moby might no longer be up to the job. Arthur was growing fast, and I found his weight made the stretchy wrap sag after I’d been wearing him for a while. 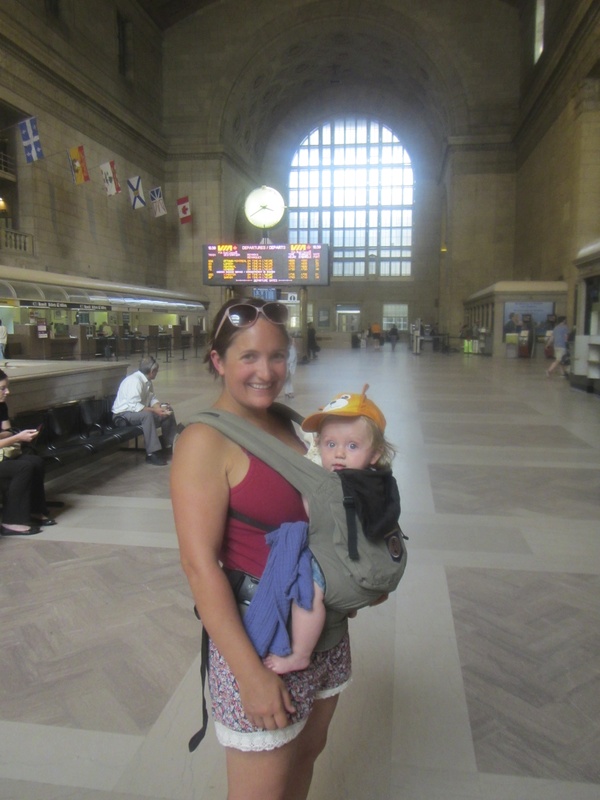 It was time to find a new solution, and the best solution we could find was the ERGObaby. Leigh tried it out first, and both him and Arthur loved it. I was a little bit disappointed with how utilitarian it looked, but I couldn’t deny it worked well. Easy to slip on and off, and its handy pocket particularly useful for when we were on the go. We used it to take Arthur to festivals, and even on an epic journey from New York to Toronto and Halifax by train. It made his first plane trips a breeze too. But despite the convenience of the Ergo, I was longing for something a bit – well, prettier. Arthur and his carrier had become my most commonly worn accessory, and I was getting a bit bored of sensible khaki. I thought about dabbling with woven wraps, lusted after some online in beautiful fabrics, but after the ease of the buckles it seemed like such a hassle. And then I came across the Connecta. We were actually asked to do some modelling shots for them through a friend and were given a couple of carriers in return. I was sceptical at first, not having heard of Connecta before, but they soon won me over. The Connecta shared the ease of the Ergo with its simple straps and buckles, and was just as comfy if not more so despite using much less padding. I find now that Arthur’s getting heavier by the day that the way the Connecta holds him high and close really helps protect my back – I can wear him for hours at a time without so much as a twinge. The Connecta is really easy to breastfeed in too, which is definitely a bonus. And, even better, the Connecta is available in a huge array of fabrics! From funky prints to wrap conversions, from gorgeous silks to warm tweed: my yearning for something stylish and practical as a new mum was more than satisfied. 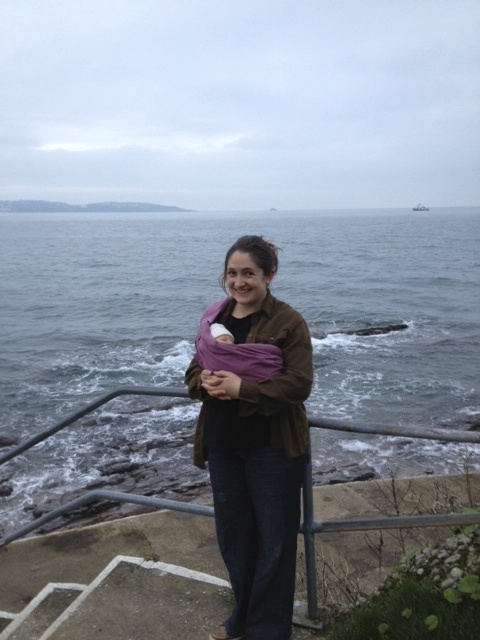 What my adventures in babywearing have taught me so far is that the key thing is finding a way to do it that suits you. I never would have imagined that I would still be wearing Arthur so regularly at fifteen months, but now I’m on the verge of upgrading to a toddler Connecta so I can continue for, hopefully, a good while longer yet. Arthur is of course walking now, but he’s not confident or strong enough to walk for any length of time. Even when he is I imagine I’ll have my carrier in my bag ready for when he’s tired or needs a cuddle. I honestly believe that babywearing has been key to the relationship I’ve developed with Arthur. Studies have shown that it has a whole raft of benefits for both mother and child – and in fact for developing closeness with other carers, as Arthur has done with his dad and my mum. For me, though, it’s really just helped me maintain my independence and sense of self whilst navigating this new territory of becoming a mum. It might seem like a contradiction in terms as that independence has been won whilst having a little person strapped to me, but if he wasn’t I doubt I would have managed to write or travel or just hang out quite as freely as I have. 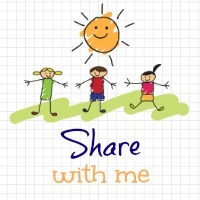 I’d love to hear your babywearing experiences so please feel free to add them in the comments. I’m also happy to answer any questions you might have about babywearing – and if I can’t answer them myself I’m sure I can point you in the direction of someone who can! 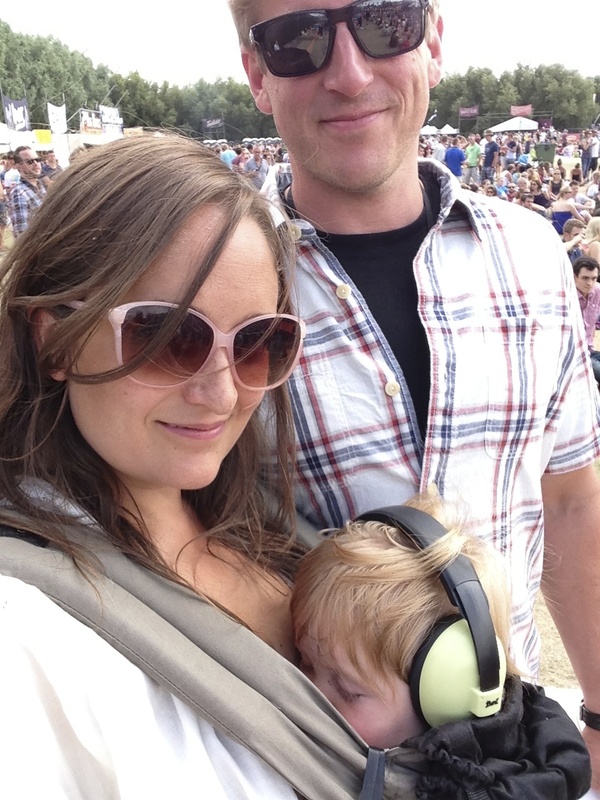 This entry was posted in Sophie is parenting, Uncategorized and tagged Attachment parenting, Babasling, babywearing, Connecta, Ergobaby, Moby wrap, motherhood on March 19, 2014 by sophieblovett. I love love love our sling and still use it for both of my girls even though the older one is 2 1/2!! They make life so blinkin easy don’t they. No having to wait for the lift. Amazing. You just need one that you are confident with. Cuddles on the go- what’s not to love!! Thanks for the fab linky! I knew nothing about baby wearing really till Arthur came along, but it definitely gets addictive once you start. And the Connecta is really very supportive – my legs ache from the extra weight before my back does! I never really got to grips with carriers, and very quickly found all three of mine too heavy. I do like our ergo, but I can’t carry the wee girl any distance in it now 😦 My hubby likes our Little life backpack, but I can’t lift it!